Home » Brass See Case Feeder Mirror by Ballistic Tools, Inc.
No more straining your neck or standing on your tip toes to see what's in your progressive press feeder. Dillon and RCBS presses place the case feeder in a high position that is difficult to see into, even with a low bench. 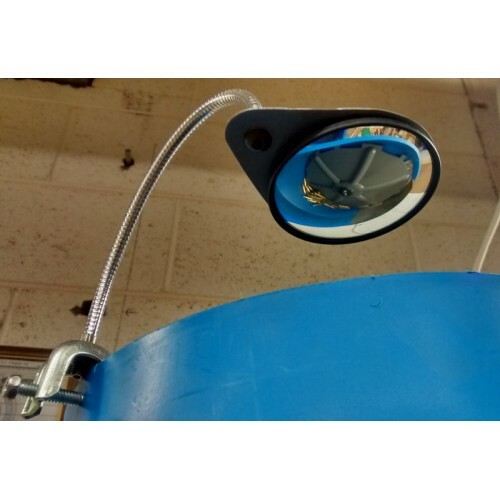 The Brass See™ offers a convex mirror with flexible mounting hardware that lets you easily inspect the level of remaining brass and any problems occuring in the feeder bowl, without any ladders or tip-toes involved. Multiple configuration options allow customization to fit your particular set-up. Universal fit for Dillon, RCBS, and other bowl-type feeders. Adjusts to an unlimited number of positions to accommodate your particular setup and amount of clearance. Convex mirror allows for full view of contents of bowl and of any jams near the gate area. Works with Dillon, RCBS, and many other bowl-type feeders. Does not interfere with normal feeder operation. Tested on fully automatic presses for shaking and vibration performance.